In keeping with the author's preference for quiet, these are all low-key but inspiring selections from "New Age Music" albums. It's music that has "pathos", emotion, depth of feeling. It engages the creative spirit. It'll put you in the Zone. Most selections would be great background music while you are writing, composing, or just savoring Life. Some of it might even be a bit melancholic. It doesn't have unchanging repetitive loops. It won't "degenerate" into rock or "light" rock. Naturally, each of us has a unique take on what constitutes "Top Tunes", so try one or two. Give 'em a chance. Often a person doesn't develop a liking to a track until after listening the second or third time. Also, something that is experienced as quiet and pleasing at home may be irritating when heard in a noisy car. The author has bought many CDs and MP3 albums based on a pretty selection played on Pandora, or (in the 80s/90s) on a radio station called "Musical Starstreams", only to find that the rest of the selections on the album were easy-listening, drone, atonal, or turned into rock. So you can use Jimmy's "Ambient top 500 list" to spare you from the same fate. If several selections are listed here, but not the entire album, it's because (in my opinion, at least) the rest of the tracks have too much "rock", or are "drone", or are just repetitive loops. On the other hand, if a whole-album link appears in addition to the tracks, it's because all - or at least enough - of the tracks met the criteria listed above for quiet, engaging music. Olafur Arnalds, Michael Whalen, or George Winston for mainly piano-oriented music. To listen to or purchase one of the MP3s, or perhaps the whole album, just click one of the grey individual track links or one of the red whole album links. The individual MP3s are usually $0.99 each. Whole albums range from $5.99 to $9.99. Buying from these links will help yours truly maintain The Wrackline Blog as an AD-FREE web site! As a side note: Every one of the tracks or entire albums shown below have been purchased by me from Amazon. If the service goes away, so do all your favorite songs. A lot of this quiet stuff is not popular to the masses. So the streaming service may elect to remove your favorite soft, quiet (but relatively unpopular) tunes from their lists. If you own all your MP3 albums, you can still listen to them 5 or 10 years in the future! Not convinced? If you would prefer to use Amazon's streaming music service instead, I have a link for their streaming service at the bottom of this page. Also on "A Wyndam Hill Retrospective"
on “Conferring with the Moon” Also on "Returning"
Also on "Returning", "Meditation", and "Wyndam Hill Retrospective"
William Ackerman: “The Impending Death of the Virgin Spirit” on “Passage” Also on "Returning", "Meditation", and "Wyndam Hill Retrospective"
The Impending Death. . .
Portal of Transformutation. . .
Portal of the Luminous. . .
Loftio Verour Skyndilega. . .
Nightwalk Across the Isle . . . Album is a 2-disk set. Harmony and the . . . Album has 27 quiet and peaceful selections! Sounds similiar to Tim Wheater's flute work. This is NOT all "slow"
Take Me Gently Across. . .
A melancholy but beautiful album. My Mind was a Fog. . . I Could Hear the Water. . . The entire album is nice quiet music, although there is a bit of similiarity in all selections. This is among the most relaxing music I have ever heard. The following four tracks are excellent as well. The bell-like sounds are created by the indonesian "Gamelan" instruments. One of 4 long selections, available as "album only"
The entire album is beautiful. Entire album is quiet, meditative selections. Available as CD only. Other good selections: "Porcelain", "Carrie", "Gabrielle", "Hudson", "Cadeau"
The Rain Falls. . .
John Powell: “Flying With Mother” on “How To Train Your Dragon 2 Soundtrack” This is pure delight! Album available as CD only. Other good selections: "Resurrection", "Silence", and especially the one below. Raphael: “I Say Rock'n Roll Prayers to a Dancing God” on “Music to Disappear In” Don't worry. It really isn't "rock & roll"
Sigur Ros: “Untitled 3” on “( )” Yep. That's the album name! May be named "Sigur 3"
Shores of the High. . .
A Meaningful Moment. . . Album is two very long tracks. Part A is very good. Oh How Lovely Was. . .
As the Earth Kissed. . . Various: Oystein Sevag: “White Wings” on “New Romantics - A Hearts of Space Collection"
Various: Mychael Danna: "Sky 7” on “New Romantics - A Hearts of Space Collection"
Various: Bill Douglas: “Heaven In a Wild Flower” on “New Romantics - A Hearts of Space Collection"
Various: Paul Sauvanet: “Land of an Angel” on “New Romantics - A Hearts of Space Collection"
Various: Raphael: “Joy of Forgiveness” on “New Romantics - A Hearts of Space Collection"
I Have Loved You . . . Swimming in a Lovely Sea. . . This is a slow piece, but very nice chords. Similiar selections are: "The Light Becomes You", "The Mirror of God", "Two Breaths of Forever". 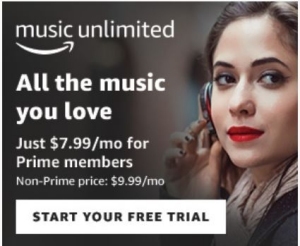 Want to try Amazon's "Music Unlimited" streaming service instead of buying MP3s? I found the correct page on Amazon's site and provided a link to that page on the right. As of 4/2019, it's $7.99 a month for Prime members or $9.99 a month for non-Prime members.